Josh Eichorn: Keeps his palms baby soft with frequent lubrication. The Atlantean relentlessly punches at the wall of Stronghold Penitentiary until he is able to finally breach his cell. He escapes from custody so that he can go to aid his people, breaking free just days before his official release. The recent conquest of Atlantis by the Gods finally reached the Atlantean and he could not bear the thought of remaining incarcerated whilst his people suffer. His former captors wonder if he will attempt another invasion but it is figured to be relatively safe until the Atlantean can find a means to prevent his army from bursting due to explosive decompression. Rita Jonson is carjacked by an agent of the Covenant of the Sword who strikes her down before fleeing with her vehicle, her two young sons still in the car. Damien DarkLord firmly believes that children are the future and that he has seen glimpses of events to come. He believes that only he is prepared for what is to come and that the fate of the entire planet rests in his hands. Smasher listens to his speech as Damien’s telepathic energies engulf her body and she is informed that those she loves will harm the planet. For the sake of the Earth, Smasher is informed that she must eliminate Dragon. In a surprising move, PowerHouse goes to speak with Dragon and apologises for the misunderstanding caused by the Wicked Worm’s possession of Mighty Man. He had been under the mistaken impression that Dragon sent Mighty Man after the Vicious Circle as a warning which led to retaliation. Dragon accepts this apology but wants to know just what PowerHouse is after. 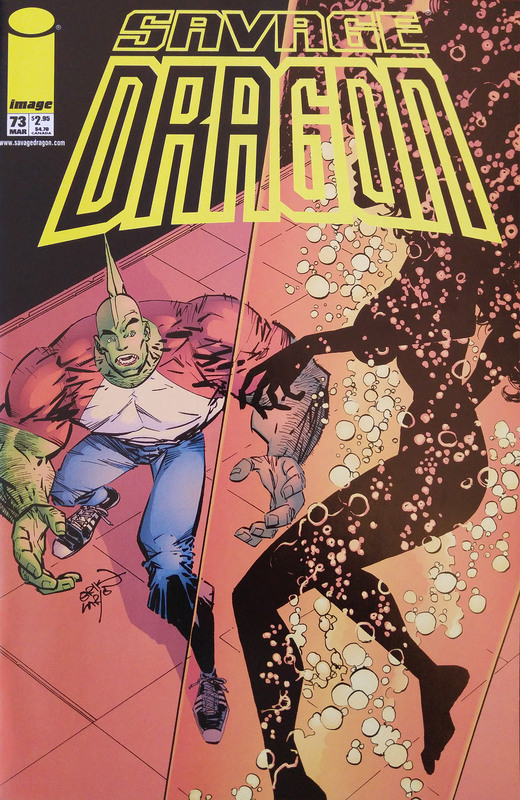 The abduction of Baby Boom is discussed and due to Dragon’s previous dealings with DarkLord, it was suggested that he could help in the recovery of the missing infant super-freak. Mighty Man figures that as he and Dragon are searching for the Covenant of the Sword then they could strike up a deal with PowerHouse. One of the Vicious Circle, Mako, used to be part of the Covenant and he could provide information that would enable them to locate SuperPatriot. Mighty Man also suspects that DarkLord and the Covenant could be involved with one another and the kidnapping of Rita’s children could be linked too. PowerHouse gives his word that he will assist in any way that he can and his new allies have little choice but to trust him if they hope to retrieve SuperPatriot. Back in Stronghold, Bludgeon has finally made a decision regarding his powers and does not believe that having them is worth the effort. Due to his part in the death of his brother Star, Bludgeon requests that Negate be allowed to visit his cell and he has superhuman abilities removed. Some time later, Bludgeon receives a visit from what appears to be She-Dragon. She is annoyed at Bludgeon’s decision as his might could have aided her in achieving her goals. As she leaves the prison, the real She-Dragon exposes her doppelganger as her Darkworld counterpart. She quickly takes down her double and demands that she turn over every piece of information in her possession regarding DarkLord. The Atlantean returns to the now risen city of Atlantis and sounds a large horn, the sound of which resonates throughout the city. The Gods fear some kind of attack but Thor eagerly anticipates action, only to be alarmed when the sun is blotted out from the sky. Atlantis is then besieged by a number of giant sea monsters that utterly destroy the entire city, eradicating the Gods residing there. Dragon stops by the precinct of Chicago’s S.O.S. and hands a sealed envelope to Sgt. Marvel, instructing him to open it in three days should no one hear from him. He then departs and the note is immediately torn open. Dragon had written that he knew that Sgt. Marvel would not wait the instructed amount of time and that he is going on a rescue mission. Negate returns to his cell where a powerful gas suddenly pumps out through his toilet which swiftly renders him unconscious. DarkLord breaches the floor underneath and Negate and makes off with his latest prisoner.